SOCIAL PROTECTION MINISTER Joan Burton has indicated the Free Travel Scheme for pensioners will not be touched in the upcoming Budget. It follows the launch of a campaign by Age Action, the lobby group representing older people, yesterday, urging the Government not to meddle with the scheme. 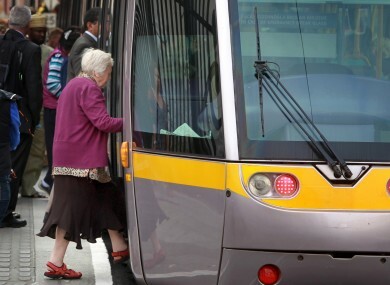 Currently, anyone over 65 is entitled to a pass entitling them to free public transport. However, a review of the scheme is currently under way. Asked by Pat Kenny on Newstalk today if there was a threat to the free travel scheme, Burton replied “absolutely none,” adding that there would be no change to the system. While, speaking yesterday, Public Transport Minister Alan Kelly also said he didn’t believe there would be changes. “As Minister for Public Transport it’s not something that’s even come on my radar to be honest,” he told reporters. I don’t imagine there’s going to be changes. Age Action Ireland’s Head of Advocacy Eamon Timmins said he welcomed Burton’s comments, but raised questions about the ongoing review. “Why are they reviewing it then? This would suggest the review is going to be ignored whatever it is,” Timmins told TheJournal.ie. “We would really would welcome it if there is no changes,” he said, adding that the Government was sending “confused” signals. Launching its campaign on the issue at Buswell’s Hotel yesterday morning, the lobby group said that any attempts to limit the scheme would be strongly opposed, and urged its members to contact their local TD or senator. The Free Travel Scheme was introduced by former Taoiseach Charles Haughey, during his term as Finance Minister, in 1967. Email “"Absolutely none": Changes to Free Travel Pass are off the table, says Burton”. Feedback on “"Absolutely none": Changes to Free Travel Pass are off the table, says Burton”.